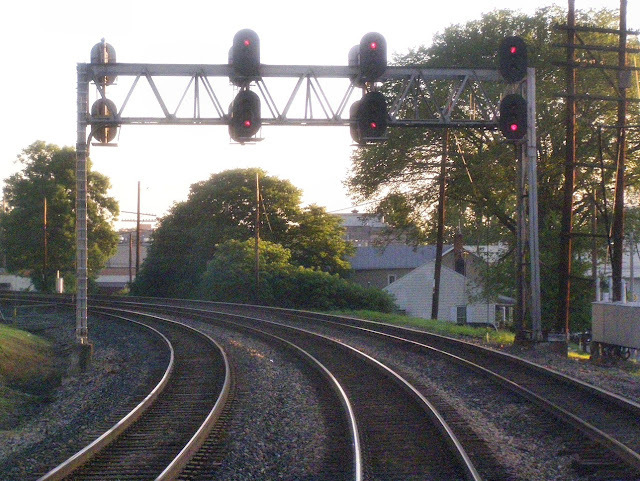 The Chesapeake and Ohio color light signal aspect set is the crazy uncle of eastern US speed signaling, From a distance they look perfectly respectable, carrying on like all the other railroads, but upon closer inspection some major deviations pop out at you. 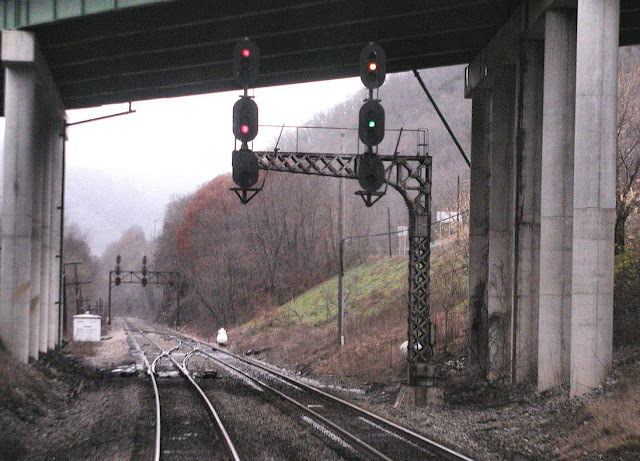 One might say that the Chessie System merger was a marriage of two equally odd signaling systems, equally odd in two completely different ways that is. If B&O CPLs are being purged due to their complexity, the C&O system is meeting the torch simply because it is batshit crazy once it gets a little liquor into it. Let's cut to the chart and see what I'm talking about. Like I said, at first glance the C&O looks like a very responsible Northeastern style railroad. You have your Y/G Approach medium, even Y/Y Approach Slow! That's a big step up on the New York Central and others with Y/Y for Advance Approach. R/R/G for Slow Clear is pretty standard and then R/Y/R for Medium App.... Wait...R/Y/R isn't Medium Approach...the label says Slow Approach. Hmmm, must by a typo because why would you have a third head available and not use it Slow Approach? Wait...if R/Y/R isn't Medium Approach what exactly is Medium Approach. Oh boy, yeah, not I see the problem. R/Y/Y is Medium Approach. It looks like the entire indication was an afterthought, sort of like how the PRR used to diverge trains to stop over Approach until 1956. Still, if you have a third head to play with there is no need to see the cost of flasher relays come down. Makes me wonder if they could have gotten away with R/R/Y for Slow Approach and R/Y/ / for Restricting. This is one of the few cases where a red lamp is lit to upgrade a dark head and upgrade the signal indication (in this case from Restricting to Slow Approach). This is also one of the few cases where Restricting is more common operationally than Medium Approach. Doing with 8 lamps what other railroads do with 9. It seems that the C&O was really trying to use a two headed signal system, but ultimately had to abandon the idea. First, Stop is only R/R as the only time an R lamp is present on the third head is for Slow Approach. Restricting is R/Y in all cases, no R/R/Y. 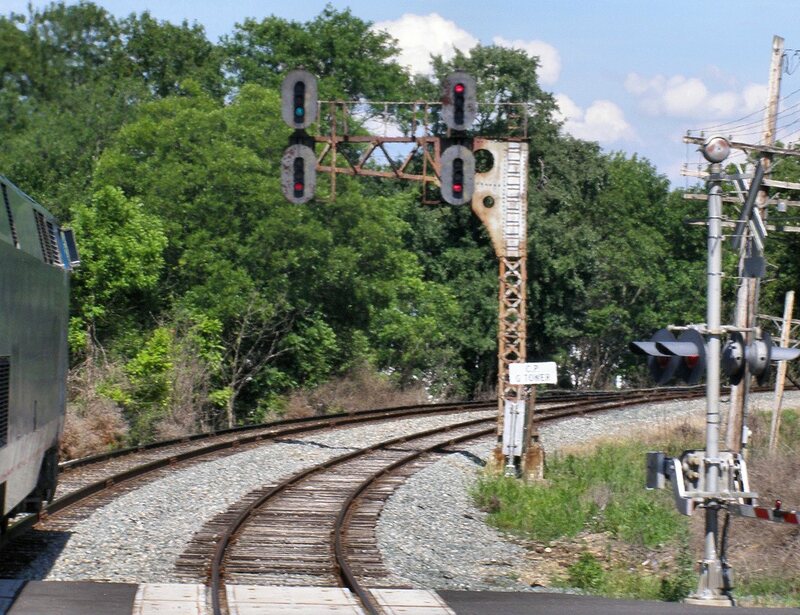 and if trains diverged to stop over Approach then you avoid the third head in most situations. Placing a lower maker to upgrade Restricting to Slow Approach would suffice in those situations where the turnout speed was low. Eventually it seems that someone thought better of this idea, but with R/Y/R already given away so the C&O was forced to scramble. 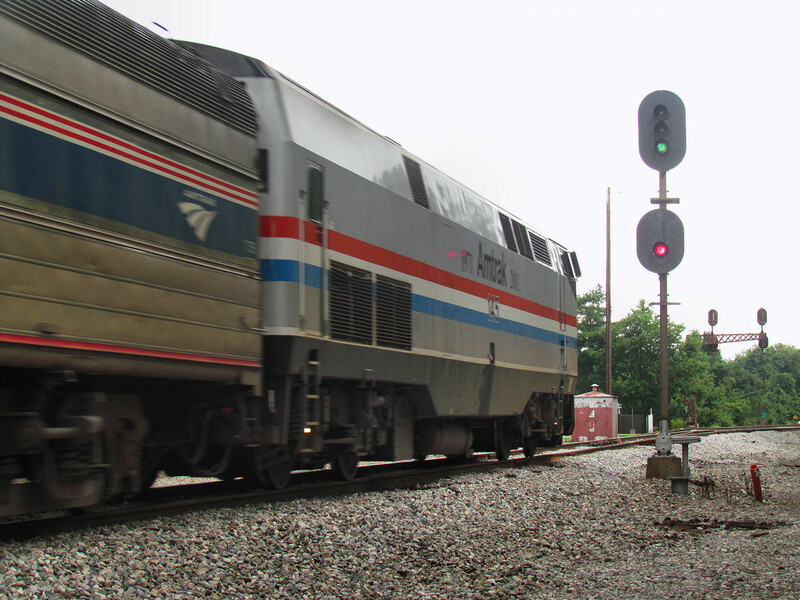 When limited speed turnouts appeared the C&O had to scramble again by using R/*Y*/Y for Limited Approach. 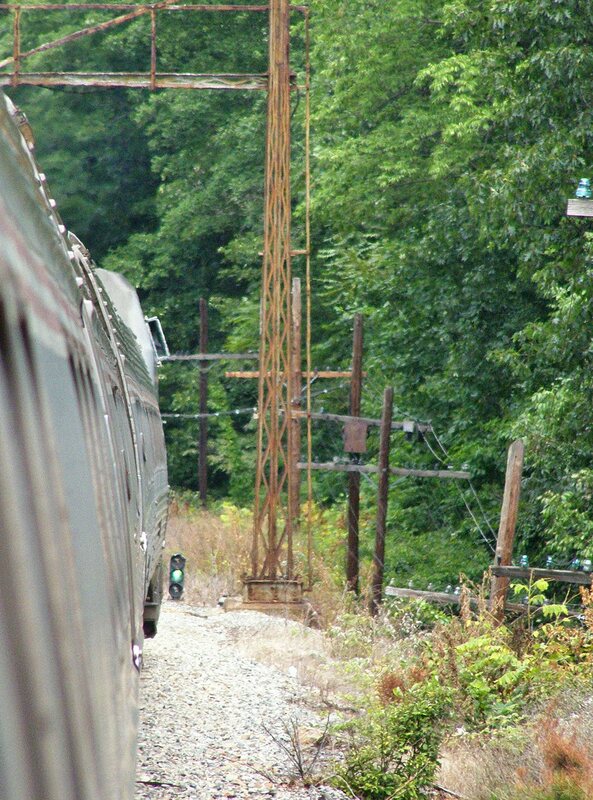 No wonder the C&O had a thing for exit signals. Enter interlocking? Pass a signal. Exist interlocking? Pass another signal. This brings up another quirk. The C&O placed its Red lamp in the upper position on its upper head and the bottom position on the second or middle head. This gave a wider spacing between Red lamps, but made the concept of "high" green a bit less applicable. The combination signals Medium Approach Slow and Medium Approach Medium match what was seen on the Seaboard, NY Central and elsewhere with R/Y/G for M-A-S and R/Y/*G* for M-A-M. 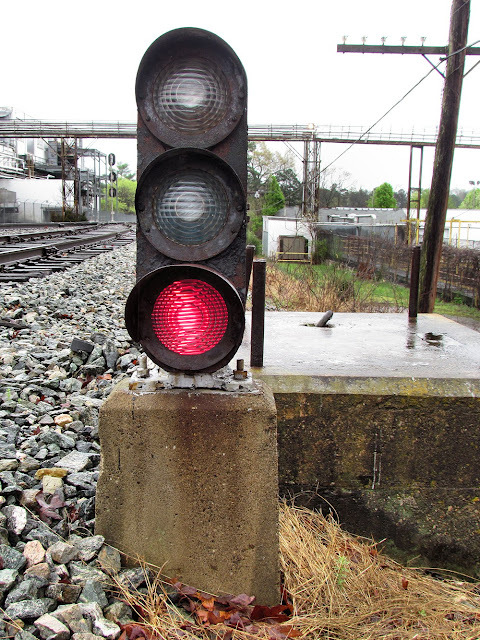 I've explained this before, but it assumed a dwarf siding exit signal displaying Slow speed indications. Speaking of dwarf signals, why don't we take a look at one. Bottom placement of the R lens on dwarfs allowed for Y/R Slow Approach with Y being Restricting, avoiding the need to flash Y as seen on NORAC. R/Y was also a Restricting Option. Slow Clear could be either G or G/R, but in a bit if clever thinking the C&O went with *G* to upgrade slow speed siding exits to Medium Speed, as opposed to NORAC going with G/*R* and leaving *G* for the less applicable Limited Clear. The rest of the C&O scheme was all pretty standard with the usual mix of Approach Medium/Limited and Medium/Limited Clear. Is there a slow speed route? No, just Medium Approach. 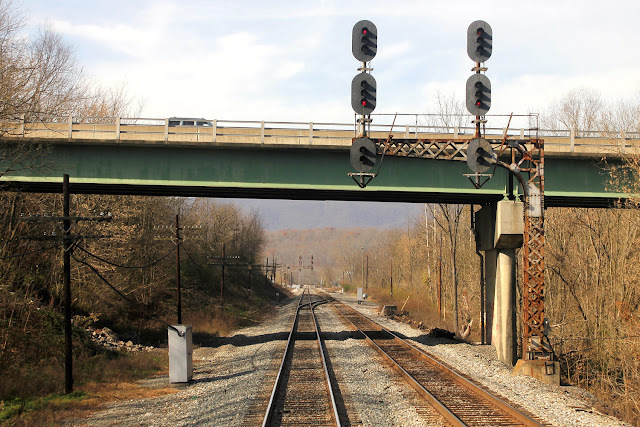 In summary, before flashing signals were accepted, railroads were constantly placed in the bind of how to handle both Slow speed signals AND Restricting. Some, like the Seaboard, went the Lunar White route and used three heads. Others, like the Reading and NY Central, skipped Slow Approach on high signals. The PRR dumped Medium Approach in favor of Slow Approach. The C&O went with Plan D, sacrificing BOTH Slow and Medium Approach in favor of Restricting. Yes, the third head is common enough so that Medium Approach isn't rare, but there are many situations where only two heads were provided requiring trains to get an exit signal or simply diverge to stop over Restricting. It's a real shame there isn't much room in our national rail system for unique and interesting signal systems such as this. Not only does the C&O suffer from not being as lamp efficient as some others, it is a bit less intuitive, relies on dark signal heads and conflicts with many other more popular systems. Going forward only the Buckingham Branch shortline appears committed to the C&O system, however as they remove the remaining signaled sidings on the C&O Washington route there won't be much of an occasion to show it off. BTW, I am celebrating a milestone at The Position Light today with my 251st post. 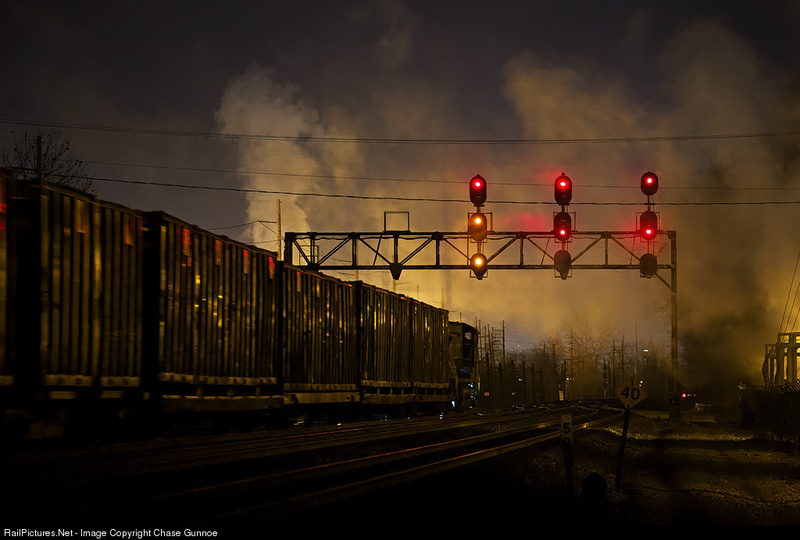 "The PRR dumped Medium Approach in favor of Slow Approach." Medium Approach came later in the PRR scheme by use of a golden triangle or a flasher to upgrade a Slow Approach. Yes, I was only referring to the original formulation of the PRR signal aspects through 1956. I need to find an older C&O rulebook to see if Medium Approach was added later. Oh, I believe the triangle only upgraded Approach Medium and Medium Clear to Approach Limited and Limited Clear. The original C&O signal system never used "flashing" indications. Your 2004 diagram shows its influence after the Seaboard System indications were added. 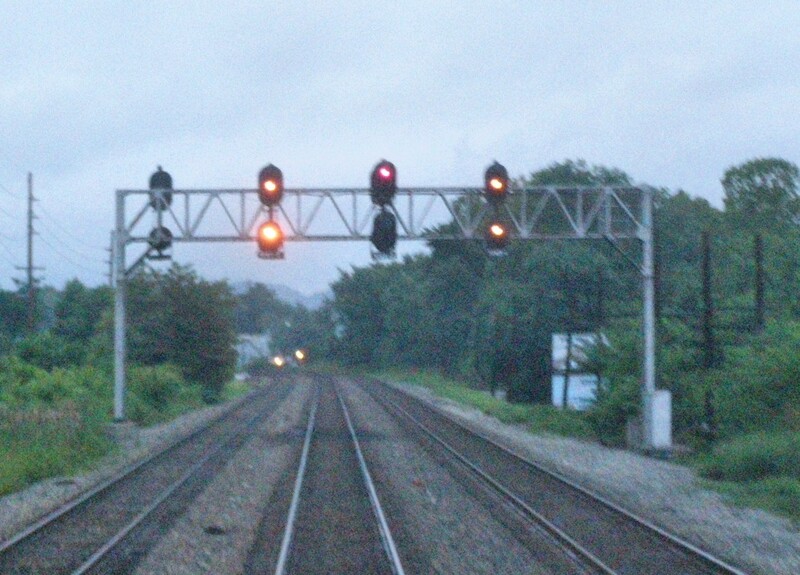 I don't know when the flashing indications were added, but the signal system remains to this day the "Chessie" or C&O system even under the CSX umbrella. That's why they get the rules prefixed with a 'C'. It is sort of like how both the Southern and N&W systems are still "alive" under NS. Each has their own section in the rulebook.